This is one of the best value wines in the country. 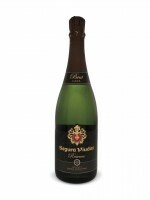 Made in the same method as Champagne, with secondary fermentation taking place in the bottle, this crisp and attractive sparkling wine is consistently enjoyable. It’s noteworthy thanks to its elegance, persistent bubbles and refined flavours. Better yet, the Brut Reserva is flavourful enough to enjoy on its own or with a meal and affordable enough to use as the base wine for Mimosas or other sparkling wine cocktails.